Let Elvis be your tour guide on this 2-hour private excursion in Sin City. 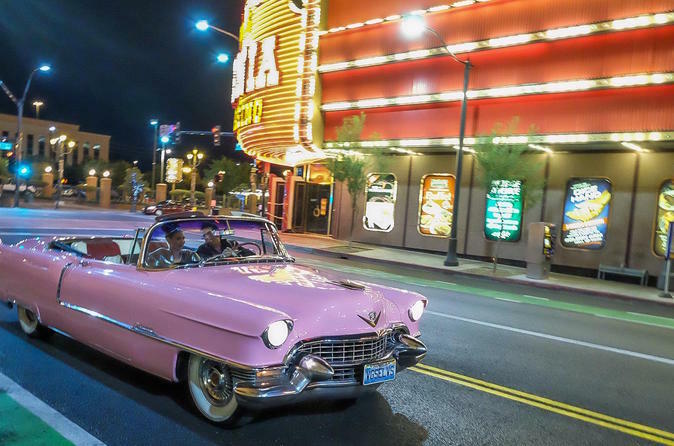 Travel in a pink Cadillac driven by The King himself, stopping at all the most important Las Vegas landmarks for photo ops. Get serenaded by some Elvis classics and learn about the history and culture of this vibrant town. Souvenir sunglasses and round-trip hotel transportation are included. Your guide is the 'Official Elvis of Las Vegas', has appeared on more than two hundred television talk shows and has received a key to the city. As you ride around town, he'll serenade you with Elvis classics and point out Sin City's highlights and landmarks. Cruise down Las Vegas Boulevard to the 'Welcome to Las Vegas' sign, where you'll hop out for a photo op and some tunes. Hit up Fremont Street in downtown Las Vegas to see where the town started. Pass lots of wedding chapels along the way, some of which have hosted nuptials for celebrities such as Brittany Spears, Michael Jordan and Elizabeth Taylor. Your last stop is the Westgate Hotel, originally known as the International Hotel. View the full-size Elvis statue commemorating his 837 consecutive sold-out performances. End your 2-hour tour with drop-off back at your hotel.